Speed it up – Where's my paintbrush? 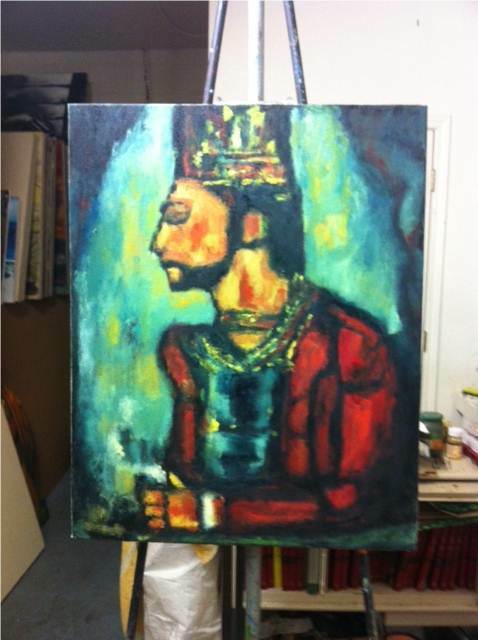 On Sunday, I walked into Michael’s studio and immediately noticed that my painting – I’m still working on the study of Rouault’s The Old King – was on the easel, but the photo of the original was not. I was on to Michael and said, “You are taking away my crutch.” He replied that yes, indeed, I was going to paint by determining what the painting needed, not by looking at the photo. It was an excellent lesson, and I made tremendous progress on the painting. Wednesday’s art class started off with my usual trepidation. The crutch was still gone, so I began slowly putting paint on the canvas. Michael told me to speed it up. I’m conquering the “use more paint!” directive and the “paint without a crutch” order, but this “speed it up” mandate has been harder and I’ve been resistant to Michael’s instructions. What if in my haste I mess up the work I’ve already done? What if I don’t think it through enough and end up making a huge mistake? What if…..I’m running out of excuses. Michael said, “Mix paint fast. Paint fast. Step back and look at the canvas every few minutes. Now go!” To motivate me further, he flipped on the Thunder, Lightning, Strike album by The Go! Team. If you ever need an injection of speed and optimism, put this album on. Wow. It’s the music equivalent of a double-espresso paired with a chocolate chip cookie. Tracks include “The Power is On,” “Panther Dash,” “We Just Won’t Be Defeated”…..you get the idea. For the next 75 minutes, I was ON. Mixing paint quickly, putting it on the canvas quickly, and stepping back often to see the incredible results of moving fast. He’s right. When I painted fast, I was using my instinct. Everything I’ve learned, all my experience, came out on the canvas. Moving fast helped me conquer my fear of “messing up” and produced better work than moving slowly. In moving fast, I also realized I was stepping back from the canvas more often to look at the big picture (literally and figuratively), and I could immediately see what I needed to do next. And it was one of the most enjoyable, memorable painting experiences I’ve had. Just plain fun. Try this next time you find yourself hesitating or moving too slowly on a project. If you’re a writer, just write and get the words on the page. If you’re working on a presentation, work quickly through the slides. If you are hosting a meeting, try to get it done in half the time. Move fast, don’t over-think, and step back occasionally to see the big picture. And if you need a jolt of motivation, download The Go! Team album. Pingback: The incomparable Georges Rouault | Where's my paintbrush? Pingback: Confronting a disappointing piece | Where's my paintbrush?